Moosaa Richardson continues his reading of Shaykh Saalih al-Fowzaan's explanation of the chapters on manners from Buloogh al-Maraam. 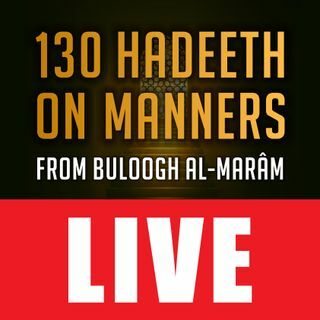 This class covers Hadeeth 10 about the manners of sneezing and the dialogue of supplications which follow it, as well as Hadeeth 11 about the manners of drinking. These lessons are a study of the great book, Buloogh al-Maraam, by al-Haafith Ibn Hajar (may Allaah have Mercy on him). The explanation of Shaykh Saalih al-Fowzaan (may Allaah preserve him), ... See More Et-haaf al-Keraam, is read word-for-word, in Arabic, and translated into clear English. This eighth lesson was recorded at al-Masjid al-Awwal in Pittsburgh, Pennsylvania (USA) on 1440.02.26.